Alford, John R., & Hibbing, John R. (2006). The Neural Basis of Representative Democracy. Paper presented at the Hendricks Conference on Biology, Evolution, and Political Behavior. Price, Michael E. (2004). Judgements about cooperators and freeriders on a Shuar work team: An evolutionary psychological perspective. Organization Behavior and Human Decision Processes 101 20-35. Wolak, Jennifer & Marcus, Geroge. 2006. Personality and Emotional Response: Strategic and Tactical Response to Changing Political Circumstances. Paper presented at the Hendricks Conference on Biology, Evolution, and Political Behavior. Another batch of articles related to the Hendricks Symposium. Notes and stuff is below the fold, but on top is a neat psychological survey given to a hyper-violent, essentially stone-age population in South America. Imagine that a community is going to have a minga to build a system of pipes that will bring running water up to the houses of the people in the community. But, there are only enough pipes to bring water to half of the community. Only the houses that are closest to the river are within reach of the pipes. This picture demonstrates what the pipe system will look like after the minga is finished. The river is drawn in blue, the pipes in red, and the houses in black. So, only half of the community will receive running water as the result of this minga. That is, only half of the community will benefit directly as the result of this minga. A lot of hard work is involved in this minga, so the minga will last 2 days. In order to complete this minga in 2 days, the help of all socios in the community is needed. Imagine that only the first day of the minga has been completed. The first day of the minga lasted 9 hours. Some of the citizens (socios) in the community worked all day in this minga, but other citizens worked for fewer hours. I am going to show you pictures of citizens who participated in the first day of the minga, along with two pieces of information about each of these people: (1) whether or not they will receive improved access to water as the result of this minga, that is, how much they will benefit as the result of the minga, and (2) how much they have sacrificed in the minga, that is, how many hours they worked in the first day of the minga. 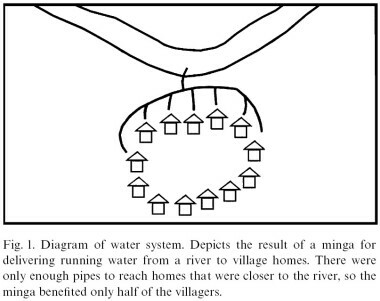 The pail of water in each picture represents the extent to which each person will benefit as the result of the minga. [SHOW PICTURE]. For example, this person lives close to the river, in reach of the pipe system that will be constructed in the minga. So, he will receive a lot of running water as the result of the minga. That is why there is a picture of a full pail of water here. This full pail of water represents that this man will benefit a lot as a result of this minga. [SHOW PICTURE]. This person, however, will not benefit much from the minga, because he lives far from the river, too far for the pipes to reach. That is why there is a picture of an almost-empty pail of water here. This almost-empty pail of water represents that this man will not benefit much as a result of this minga. The circle in each picture represents how many hours each person has worked in the minga so far. [SHOW PICTURE]. For example, this person worked for the entire first day of the mingaâ€”he worked for nine hours. That is why 3/4 of the circle is filled in, and why there is a number â€œ9â€ drawn next to the circle; this represents that the person worked for 9h in the minga. [SHOW PICTURE]. This person, however, has worked for only 3 h in the minga so far. 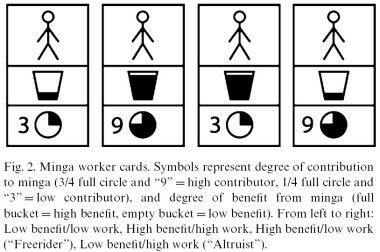 That is why only 1/4 of the circle is filled in, and why there is a number â€œ3â€ drawn next to the circle; this represents that the person has worked for only 3 h in the minga. [MAKE SURE SYMBOL MEANINGS ARE UNDERSTOOD]. 1. Which one of the people deserves more respect, based on his participation in the minga?